For this week's Iron Craft Challenge, we had to craft something with maps. I was inspired after reading this article in the Washington Post Magazine about the designer of the iconic Metro map being asked to redesign it after more than 30 years. As a DC native the Metro map is a very familiar image and one that makes me think of home. 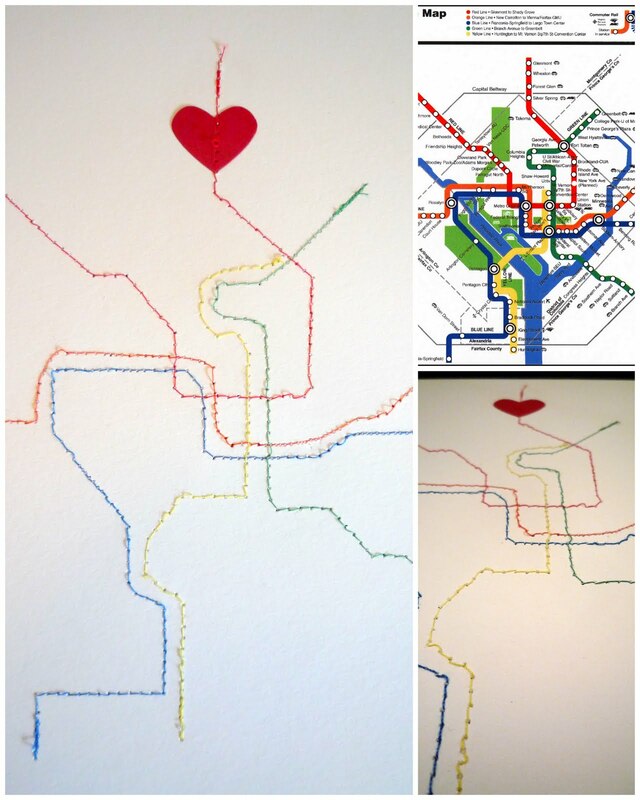 I decided to do my own little take on the metro map, with a crafty spin of course. The heart symbolizes my Metro stop in the place in the DC Metro area that I currently call home. I may take another stab at this project as I am not completely satisfied with the stitching. I plan to frame this or another attempt and add it to the growing collection of art for the gallery wall in my son's room. Pics of that coming soon. After I was done sewing I carefully tore off the printed paper to reveal my stitched map.